News IOM Q&A concerning question about headsail and mainsail sheets will be published on the Q&A- Sails page. 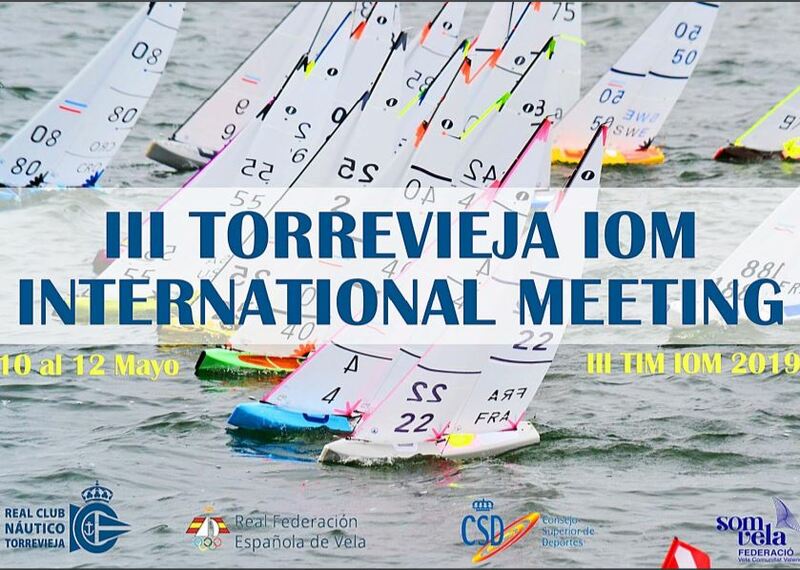 The 2019 III TIM IOM CUP International Regatta will be hosted by the Real Club Nautico de Torrevieja (Spain) from 10th to 12th May 2019. I, Fred Rocha, serving as Chairman of the Executive Committee am proud to announce the completion and approval of the application process allowing Malaysia to become the IOM ICA family’s newest National Class Association. I am hoping that you will extend your support and welcome to all their participating skippers at upcoming international events. The country of Malaysia is excited about promoting their internal growth of the International One Metre, and views this inclusion to our World Council as an important step in formalizing their domestic and international participation now and in the future. Formal MAS NCA contact information will be added to the website shortly, so please help me to make them feel welcome by extending your greetings and support. If there are any questions or concern, please feel free to contact me anytime at 001-858-752-8227, or frerocha “at” hotmail.com . The IOMICA Events Committee (EC) has received a total of three 3 bids from 2 two National Class Associations (NCAs). One bid from Portugal, and two independent bids from Italy to host the 2020 European Championship. On receipt of the bids the EC challenged the NCA of ITA as to why two signed bids had been submitted. After much communication and in-order to not get involved in the NCA of ITA internal politics it was agreed by the members of the EC to accept both bids and judge them independently on their own merits. The EC reviewed the bids and produced a follow up questionnaire. It was at this stage I regret to inform the executive committee that the NCA for POR withdrew their bid due to a change in circumstances with the proposed host club. The EC would like to put on record it’s thanks to the NCA of POR for their bid and would like to encourage a future bid from the NCA. The two bids from The NCA of ITA returned their questionnaires promptly and continued to answer all questions generated by the EC. The EC analysis of both locations included reviewing weather wheels, contacting fellow sailors and the information provided by the proposed hosts. These are the findings of the EC. Castiglionese: A good prevailing wind with a good alternative course if required. However it can suffer from weed growth. Orbetello: The Prevailing wind is from a South / South West direction with an excellent course for South west wind but limiting from North/South. Has provided evidence for all wind eventualities however some will be from fixed point of sailing. Orbetello is closer than Castiglionese for airport links and both venues have large quantities of close accommodation. Despite both ITA venues submitting strong bids, it is the opinion of the EC that based on the venue location providing a navigable course (100% weed free) and strong recommendations from other skippers. Both of these factors supported the EC’s ultimate selection to award the 2020 European Championship to NCA ITA – Orbetello (25 April to 2nd May provisional dates to be confirmed in NOR). The EC would like to put on record it’s thanks to all involved in the Castiglionese bid for yet again submitting a strong bid, however would like to raise a matter of concern relating to the IRSA Events Committee Chair trying to pass influence of the IOMICA Events Committee to look favourably on Castiglionese due to it not being selected to host the Radio Marblehead World Championship 2020. The IOMICA EC would like to state that all future IOM Championship venues need to be awarded solely on merit, and merit alone.